Limited Lifetime Powertrain Warranty is non-transferable. Terms and conditions apply. Must perform Manufacturer recommended maintenance and have oil and filter change completed at a minimum of every six months or 7,500 miles, whichever comes first. All services must be performed at a licensed repair facility. Eligible vehicle must be 2007 or newer and have less than 100,000 miles at the time of sale. Excludes (1) lease buyouts (2) vehicles covered under a manufacturer certified pre-owned (CPO) program warranty and (3) current and prior model year vehicles. Additional exclusions apply. Offer valid through close of business December 31, 2018. 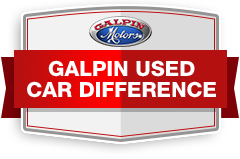 See Galpin.com for copy of limited powertrain warranty and full exclusion. Copyright © 2019 Galpin Lotus. All rights reserved.